Whether you’re long and lanky or short and sassy, denim is a sure showstopper this season. From quick and easy dresses to ’70s flare, there’s a style for everyone — and believe it or not, bell bottoms are even making their way back! 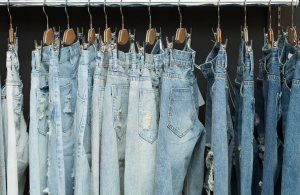 Denim, in any cut or pattern, from fun accessories to traditional trousers, is a fashion style that seems to have withstood the test of time. Did you know the bellbottom originated in the ’60s and ’70s and was based on the functional fashion of sailor pants? The wide bottoms came onto the high-sea fashion scene as a better alternative to traditional cut pants for rolling up when bottoms were wet. Who would’ve thought we’d still see this style almost 50 years later? Then, in the ’80s the denim wave took storm with vests, blazers, hats, and well…pretty much anything you can think of…and lasted well into the ’90s. Comfy, cozy and cute — the denim dress shirt offers the ease and flow of everyday wear, but with its subtle style can make any pair of leggings or skinny jeans into a modern day look. Pair with boots — low or high — to add an extra edge to this fresh outfit. This elongating fit gives a sleek and slender look to any figure by making it seem as though your legs go on forever. 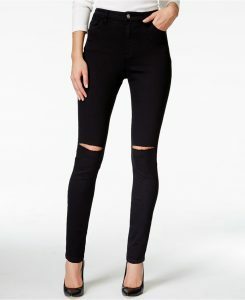 The high-waisted cut comes in both skinny jeans and flare style, making it easy to match with your personality. With a slim fit through the hips and thighs followed by a bold curve at the knee gives this retro look an edgy appeal for the fall. Pair with a petite blazer or jacket to complete the fall feel. 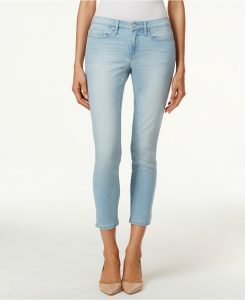 And don’t forget to change up the colors and shades to enhance your denim look. For a light-hearted daytime look, go with light or stone wash denim…and for a sultry night out, go with dark denim.